The Barn Self-cateringThis interesting 17th century barn conversion offers delightful accommodation overlooking Coniston village - the footpaths to Coniston Old Man pass the end of the lane and you are less than five minutes walk down the hill to the shops, pubs and Ruskin Museum that make Coniston a favoured year-round destination. The popular Sun Inn with open fires and good food is 100m away down the hill. Coniston water is excellent for water sports, with launching sites for dinghies and delightful lake excursions on the National Trust Gondola. Accommodation: There are two entrances. The ground floor front door opens into a large slate floored hallway with plenty of storage for your outdoor gear. One ground floor double and one twin bedroom. Bathroom with bath, separate shower, basin and wc. The first floor is accessed by internal stairs or by a sloping external path to the rear patio doors at the upper level. Here you will find a large, open plan living/dining room (wood burning stove, TV, DVD, stereo with CD/iPod docking station and free wi-fi). Well equipped kitchen. Two further bedrooms on this floor comprise a twin and a master double with en-suite three piece shower room. Additional family bathroom with bath, basin and wc and utility room with washer, dryer and additional fridge/freezer. The Barn is comfortably furnished with a pleasing blend of old and new and there are extensive views over the Coniston valley from the front windows. Exposed roof trusses, slate, timber and carpeted floors complement the interior which will be ideal for either an extended family or a number of couples wishing to stay together in comfortable surroundings. Outside: Private parking for several cars within the enclosed garden which has a good degree of privacy, mature shrubs, trees and room to sit out of doors. Coniston village centre 3 minutes walk downhill. Fuel tariff: £25 per week April to end September; £40 per week October to end March. 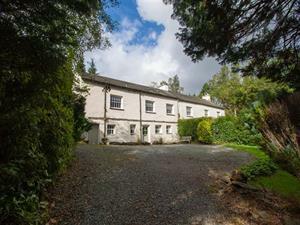 This interesting 17th century barn conversion offers delightful accommodation overlooking Coniston village - the footpaths to Coniston Old Man pass the end of the lane and you are less than five minutes walk down the hill to the shops etc. Additional bedding linen available. Children welcome from any age. The Barn offers weekly bookings starting on Friday.